Planning approval for a multi-million waste incinerator on the outskirts of Belfast has sparked outrage from across the political divide. The proposed £240m plant on the old Hightown quarry site in Mallusk was rejected last year by former environment minister Mark H Durkan, who said he saw “no need” for the project. But the controversial plans have now been given the go-ahead by the Department for Infrastructure, despite objections from thousands of concerned residents. The decision has been met with near universal condemnation, with all the main political parties voicing their objections. DUP MLA Pam Cameron described the move as a “devastating blow to the greater Mallusk community”. 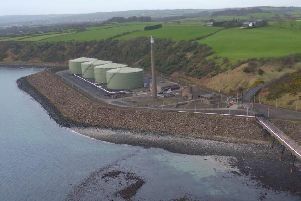 Ulster Unionist MLA Steve Aiken warned that the project could well prove “one of Northern Ireland’s costliest mistakes”, second only the Renewable Heat Incentive scandal. Branding the decision a “disgrace”, Sinn Fein MLA Gerry Kelly said all the elected representatives in the area were “united in their opposition” to the project. Alliance’s David Ford said the decision was “frustrating and disappointing” for the thousands of people who campaigned against it. He added that while the “technology may be acceptable, the location is unacceptable”. SDLP Councillor Noreen McClelland warned that the proposed facility “clearly poses a significant threat to the wellbeing of established communities in this area”. This would be sorted into waste and recyclable material, before the unusable material is burned to generate electricity. However, there has been major public opposition to the plans since they were first unveiled, with residents citing fears over traffic and impact on house prices. Over 4,000 objections were made to the scheme. When he rejected the project in 2016, Mr Durkan said he did not consider there to be any need for the facility. The matter was referred to the Planning Appeals Commission (PAC), and its decision was published yesterday by the Department for Infrastructure. The department has stated that the scheme is “in the public interest....given the strategic importance of the project for the region”. The developers behind the proposed waste incinerator have said the project will bring “considerable economic benefits” for Northern Ireland. arc21, the umbrella body dealing with waste for 11 councils in the east of Northern Ireland, first submitted the plans back in 2014. The group claims the incinerator will provide a sustainable, long term solution for the management of residual municipal waste in the arc21 area. Ulster Unionist MLA Steve Aiken has questioned the timing of the decision, claiming it was “for an elected politician to take, not an unelected, unaccountable civil servant”. The Province has been without a functioning Executive since the power-sharing institutions collapsed back in January. Mr Aiken said it was “outrageous” that such a decision has been made in the absence of an Executive minister. “Why was this regionally significant decision made now, rather than wait for either a devolved or direct rule minister to take the decision?” he asked.